The Commonwealth Aircraft CA-28 Ceres was a crop-duster aircraft manufactured in Australia by the Commonwealth Aircraft Corporation (CAC) between 1959 and 1963. The aircraft was a development of the Wirraway trainer of World War II . In the 1950s most crop-dusting aircraft in Australia were conversions of military types that met with varying success. Two CAC types so converted were the Wackett and the Wirraway. Neither type was successful in this role, the Wackett because it was underpowered and the Wirraway because it was not designed for low-level slow-speed flight. CAC saw the need for a purpose-built aircraft optimized for agricultural work. The company had a substantial number of Wirraway airframes (and large amounts of components) in stock and decided to use as much of this as possible in producing the new type. 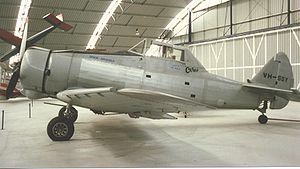 The design that emerged, while superficially similar to the Wirraway, was really a new type that used some Wirraway components rather than a conversion. The only major components used in both types without alteration were the tail group and the landing gear. The fuselage was completely new, with a 41-cubic-foot (1.16 m) hopper installed between the engine and the high-mounted single-seat cockpit. The Wirraway wing was substantially altered for use in the Ceres. The outer wing panels had slotted trailing-edge flaps and fixed leading edge slats, while the centre-section was substantially altered to accommodate the hopper, the higher weights of the Ceres, the different flaps (the Wirraway had split flaps) and the new type's fixed landing gear with CAC Mustang main wheels as opposed to the Wirraway's retractable gear (the same landing gear legs were used however). The increase in wingspan and wing area of the Ceres compared to the Wirraway was also incorporated in the centre-section, and the end result was an aircraft with much more docile stalling characteristics than those of the Wirraway. The engine was the same type, a Pratt & Whitney R-1340, but altered so that it was direct-drive instead of geared as on the Wirraway. The three-bladed variable-pitch propeller was also different, being of wider chord and smaller diameter compared to the Wirraway's to suit the Ceres' different operating regime and the direct-drive engine. The Ceres prototype first flew in February 1958 in the hands of CAC test pilot Roy Goon and the first production aircraft was delivered in April 1959. After five aircraft had been built provision was made for a rearward-facing seat behind the cockpit, housed under an extended canopy. This was the only major design change during production. CAC had hoped to sell at least fifty aircraft, but production of the Ceres ended in July 1963 after 21 aircraft had been built (one could perhaps be more accurately described as a rebuild, as it was manufactured using parts salvaged from the first aircraft, which crashed in 1961). The type succumbed to the popularity of more modern and economical designs such as the Piper Pawnee and PAC Fletcher. The Ceres survives in small numbers, with two still registered to fly in Australia and examples in museums in Australia and New Zealand, the latter being a survivor of the six Ceres exported to that country. Recently, with the popularity of the Wirraway as a Warbird and the scarcity of Wirraway components, Ceres wings have been "de-converted" for use in Wirraway restorations; because of the substantial differences between the two types this has proved to be rather troublesome. Grant, James Richie. "Sword into Ploughshare:Australia's Ceres crop-duster". Air Enthusiast (Key Publishing) (Fifty-three, Spring 1994): pp. 76-77. ISSN 0143-5450. Wilson, Stewart (1991). Wirraway, Boomerang & CA-15 in Australian Service. Aerospace Publications. pp. 206. ISBN 0-958797-88-9.